It's crazy the amount of time we spend organizing, prepping, and stressing about Christmas. I do enjoy most of it, but I also enjoy when it over and I can let out a sigh of relief. The best part is seeing the look of amazement on my kids faces on Christmas morning when they see what Santa has left for them. It makes me feel like a kid again. It's then that I know all the craziness was worth it. Now it's time to get ready for the new year. I still have a lot of left over baking goods in the pantry that I didn't get to use during the holiday season. So now I am in the process of cleaning out the pantry. I had an extra package of sugar cookie mix. Yes, I do use mixes sometimes, especially for cut out cookies. I don't seem to have much luck with these kinds of cookies otherwise. I don't know why that is. I have such luck with all other cookies. Anyway, I have seen a lot of food bloggers using cake mixes in their recipes, so I thought why not cookie mix. I'll admit, I wasn't sure it was going to work, but hey, you won't know if you don't try, right? Well, it worked. I was pleasantly surprised and excited. You do have to be careful not to over bake them though. I used my Babycakes Donut Maker Machine, but I didn't go by the timer on the machine which is usually four minutes baking time. I only baked the Sugar Cookie Donuts for three minutes each batch. Anymore than that and the bottoms get too hard when cooled. Three minutes was perfect for a nice soft, fluffy donut. The bottoms did have a slight crisp to them, kind of like a Belgian waffle does, but that is just from the sugar in the mix. 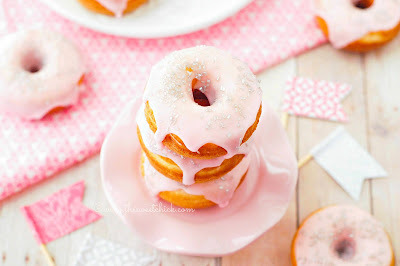 I covered them in a simple powdered sugar glaze with a drop of red food coloring for some extra excitement, but you can just make a white glaze or any other color you like. You can also buy some sugar cookie icing to spread on top instead. I love that they did come out tasting like a sugar cookie. The flavor is not as strong as it would be for a regular cookie, but the taste is there and in donut form. How cool is that? These would be great to make for a New Year's party, or any party. Preheat your Babycakes Donut Maker. Mix together milk and vinegar and set aside for a few minutes while it curdles (a replacement for buttermilk). In a medium bowl, mix together the dry sugar mix, and baking soda. Then add the egg , butter, oil, and curdled milk. Mix until completely blended. Use a piping bag, a Ziplock bag with tip cut off, or a pancake pen, fill each donut reservoir with about 2 tablespoons of batter. Bake for about 3 minutes (do not use timer on machine) or until toothpick inserted in center of donut comes out clean. Place hot donuts on cooling rack with a wax paper underneath and prepare the glaze. 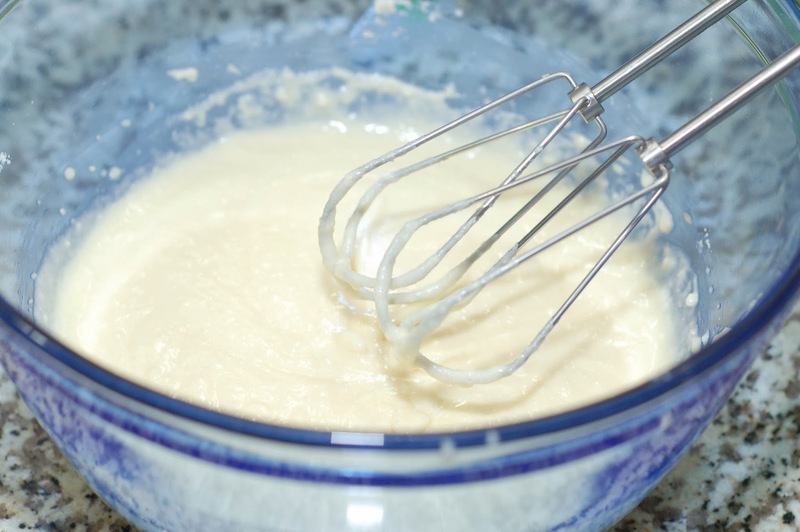 In a small bowl whisk together powdered sugar, milk, vegetable shortening, and food coloring until smooth. Add your sprinkles before the glaze dries to be sure they will stick. 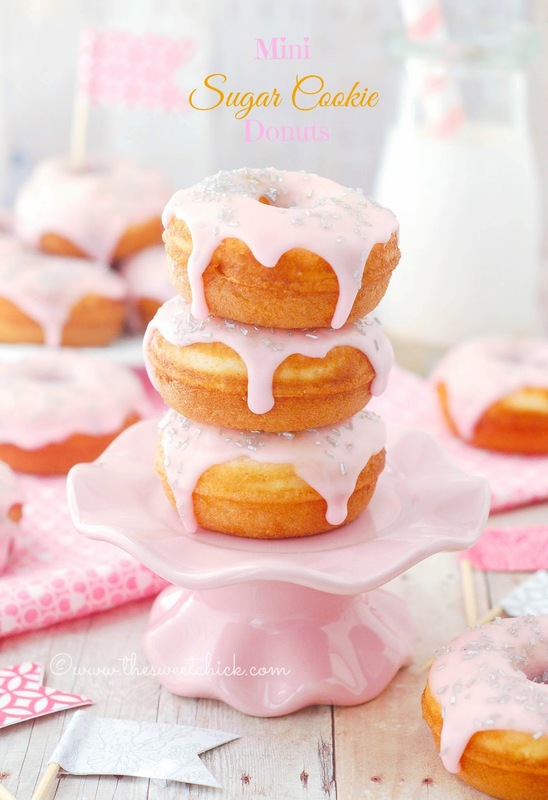 These are so pretty, I love the colour of the glaze and the sprinkles. Lovely photography, visiting from Time to Sparkle. Thank you Laura. Thanks for visiting. 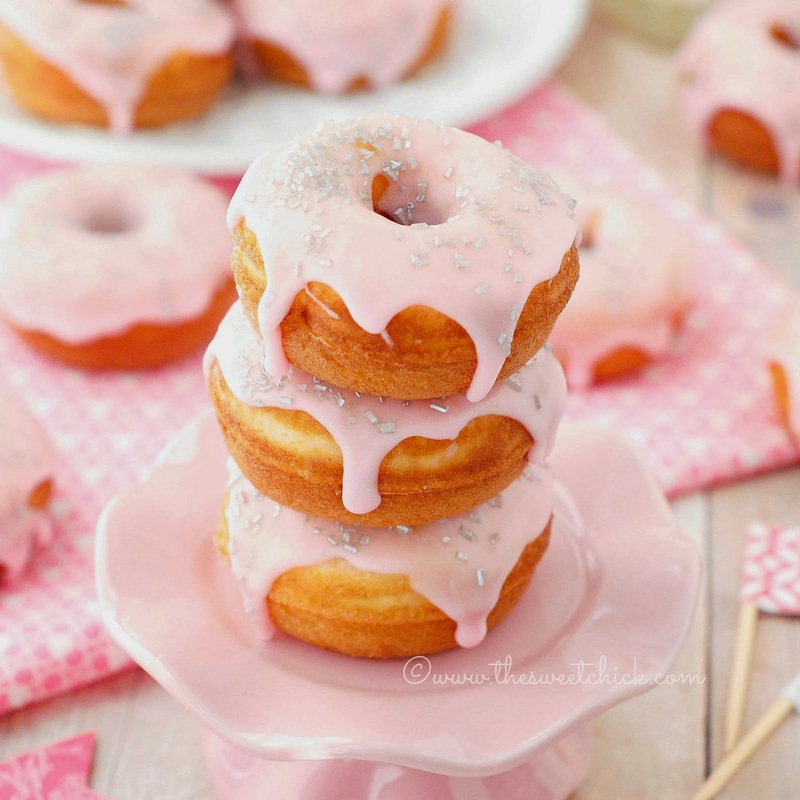 These donuts looks so tempting! Gorgeous pictures! Thank you Anup and Medha. I happen to have sugar cookie mix and the babycakes donut hole /cake pop maker. How long would you recommend cooking them for in that? Still the 3 mintues? 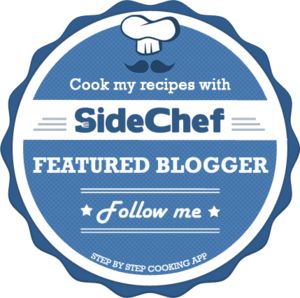 Or should I experiment? I would think it would be the same amount of time. You may have to test with a toothpick. I haven't tried them in my cake pop maker yet. Your pictures always make me smile! I love how pretty these cookie donuts are with the glittery sprinkles...and cookie donuts? Hello! That's just amazing!!!! That's very sweet Jocelyn. Thank you! These are adorable - thanks for sharing them at our Marvelous Monday party - pinning to my MM board!